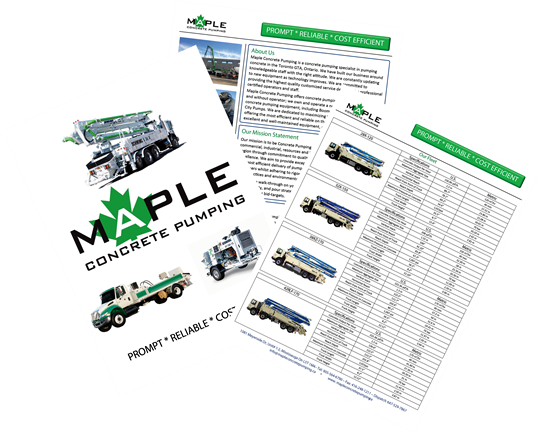 Maple Concrete Pumping offers concrete pumping rental services with and without operator, we own and operate a new and reliable fleet of concrete pumping equipment, including line pumps, City pumps and boom pumps. We are dedicated to maximizing the value of our service by offering the most efficient and reliable on the job performance, with excellent and well-maintained equipment, at very competitive rates. Our mission is to be Concrete Pumping Contractor of choice for all civil, commercial, industrial, resources and infrastructure requirements in our region through commitment to quality service with an emphasis on excellence. We aim to provide exceptional staff and equipment to ensure the most efficient delivery of pumping concrete to the satisfaction of all customers whilst adhering to rigorous industry guidelines relating to safe work practices and environmental care. Call us for a walk-through on your project. We will help with sizing, staging, safety, and pour strategies to maximize use of resources and get you under your bid-targets. We are big enough to handle complex projects but small enough to give your pours the personalized attention they deserve.